The arena is home to the NBA's Minnesota Timberwolves and the WNBA's Minnesota Lynx. The facility has also hosted the LFL's Minnesota Valkyrie, the RHI's Minnesota Arctic Blast and the Arena Football League's Minnesota Fighting Pike in the past. Original Timberwolves owners Marv Wolfenson and Harvey Ratner built, owned and operated the arena for five years beginning in 1990. The venue was managed by Ogden Entertainment after the city of Minneapolis purchased the arena in 1995. Glen Taylor acquired the Timberwolves in 1994 and the Lynx in 1999. In 2000, SFX (later Clear Channel Entertainment) took over the contract. 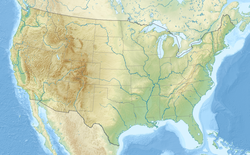 The management was changed in May 2004 from Clear Channel to Midwest Entertainment Group, a joint venture of the Timberwolves and Nederlander Concerts. On May 2, 2007, AEG Facilities assumed the management contract of Target Center. The city of Minneapolis owns the arena and AEG Facilities manages day-to-day operations. Target Center was once one of three NBA arenas with parquet floors, including TD Garden in Boston, and Amway Arena (later Amway Center) in Orlando—the floor was replaced prior to the 2007-08 NBA season. Target Center is the first arena to have a green roof. It was unveiled on September 15, 2009. In February 2011, the Timberwolves and the city of Minneapolis introduced a $155 million proposal to remodel the Target Center. Plans included shifting the main entrance to the corner of 6th Street and First Avenue, two large glass atriums, another restaurant, and a complete remodel of the interior. The plan was approved in 2012 by the Minnesota Legislature, as part of the bill that authorized a new stadium for the Minnesota Vikings. On April 3, 2015, the Minneapolis City Council gave the final approval for renovation plans for Target Center. The total cost was $140 million, which will upgrade the exterior, seats, technology and loading bays, among other areas. The city contributed $74 million. Glen Taylor, owner of the Timberwolves and Lynx, paid a total of $60 million; AEG contributed $5.9 million. As a result, the Timberwolves' lease will run until 2035. The renovated building reopened in October 2017. It hosted the 1994 NBA All-Star Game, the 1995 NCAA Women's Final Four and the 2000 NBA draft. In 2021, it will host an NCAA Men's Regional Final. 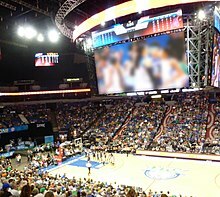 In 2011, Target Center played host to its first championship event, the 2011 WNBA Finals. The Minnesota Lynx won their first two games on their home floor, and ultimately won the WNBA Championship, the first title won by a team that played in Target Center. Target Center hosted 6 neutral site NHL games during the 1993–94 NHL season. The International Hockey League's Minnesota Moose played several of their games at Target Center during their existence from 1994 to 1996. The Boys' State High School Hockey Tournament was held at Target Center in 1998 and 1999. In June 2012, it was announced that the arena would play host to the future NCHC tournament games starting in 2014. The NCHC moved the tournament to the Xcel Energy Center in nearby St. Paul starting in 2018. The arena has been a popular venue that has hosted many concerts, including artists like Billy Joel, Garth Brooks, Justin Bieber, Elton John, Katy Perry, Metallica, Paul McCartney, and Minnesota legend Prince. December 2 Janet Jackson Janet World Tour Tony! Toni! Toné! WWE has held many events at this venue and is best known for SummerSlam 1999, Judgment Day 2005, Bragging Rights 2010, Elimination Chamber 2014 & TLC: Tables, Ladders & Chairs 2017. The Target Center held the memorable UFC championship UFC 87: Seek and Destroy in August 2008, which featured the Welterweight title match where Georges St-Pierre defeated Jon Fitch. In 1999, Target Center hosted the "People's Celebration" inaugural event for Gov. Jesse Ventura. The event drew 14,000 people, and included performances by Jonny Lang, Warren Zevon, and America. The Professional Bull Riders held a Built Ford Tough Series event at Target Center during the 2003 and 2006 seasons. The Target Center hosted the Rally for the Republic convention organized by the Campaign for Liberty, a movement founded by Texas Congressman Ron Paul, who ran an unsuccessful bid for the 2008 Republican presidential nomination. Among the attendees of the convention included former Governor of Minnesota Jesse Ventura, Barry Goldwater, Jr., and former Governor of New Mexico Gary Johnson. The Target Center is home to the Target Corporation Annual Sales Meeting, events which host more than 10,000 retail managers and employees near Target's corporate offices. In 2018, Dave Matthews performed a short set at the event. The arena is also across the street from the well-known Minneapolis nightclub First Avenue. Target Field, the home of Major League Baseball's Minnesota Twins, is located just across the street from the Target Center, and shares the public parking that the arena also uses. ^ a b c "Arena Info". Target Center. Retrieved September 30, 2016. ^ "Minnesota Timberwolves". Target Center. Retrieved January 27, 2013. ^ "Minnesota Lynx". Target Center. Retrieved January 27, 2013. ^ "Glen Taylor". Twin Cities Business Magazine. 1 July 2002. Retrieved 27 April 2016. ^ "SFX Assumes Management of Target Center". Star Tribune. Minneapolis. October 3, 2000. Retrieved January 27, 2013. ^ "Target Center". Anschutz Entertainment Group. Retrieved January 27, 2013. ^ "Target Center Renovations". RealGM. January 31, 2011. Retrieved January 27, 2013. ^ "Minnesota's Target Center Completes Green Roof". Environmental Leader. September 29, 2009. Retrieved September 29, 2009. ^ "$155 Million Target Center Renovation Proposed". KMSP. February 1, 2011. Archived from the original on October 28, 2011. Retrieved February 1, 2011. ^ Melo, Frederick (May 25, 2012). "Vikings Stadium Wins Minneapolis City Council's Final Approval". St. Paul Pioneer Press. Retrieved May 25, 2012. 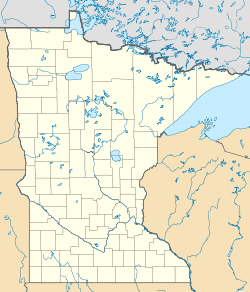 ^ "Duluth, Minn. Flood Cost Could Reach $80 Million". USA Today. June 21, 2012. Retrieved June 21, 2012. ^ Editorial Board (April 10, 2015). "Right call on Target Center renovation". Star Tribune. Retrieved September 30, 2016. ^ Target and Wolves Extend Arena Partnership NBA.com. ^ Lee, Thomas (March 30, 2012). "At Target Field, a Bullseye View of the Game". Star Tribune. Minneapolis. Archived from the original on January 27, 2013. Retrieved April 1, 2012. ^ Odum, Charles (October 7, 2011). "Lynx 73, Dream 67". WNBA Enterprises. Turner Sports & Entertainment Digital Network. Retrieved October 28, 2011. ^ Miller, Chris (June 11, 2012). "Target Center to Play Jost to NCHC Tournament". Star Tribune. Minneapolis. Retrieved June 11, 2012. ^ Keller, Wade (May 23, 2005). "WWE News: Cena at Mall of America, Judgment Day attendance, Wrestling for Jesus". Pro Wrestling Torch. Retrieved November 29, 2013. ^ "Lesnar-Coleman Headlines UFC 87 in Minnesota on August 9". UFC.com. ^ "Target Center – Rally for the Republic (Ron Paul)". City-Data. July 24, 2008. Retrieved January 27, 2013. ^ "US Bank Theater". Target Center. Retrieved January 27, 2013. ^ "Parking Information". Target Center. Retrieved January 27, 2013. Wikimedia Commons has media related to Target Center. Target Center Renovation, Official by the Target Center.